Which one would toi get? What flavor of Fraupuccino is better? Have toi ever had a regular hot chocolate? What size do toi usually pick? For my suivant trip to Starbucks I want to get something I've never had. Can anyone give me ideas on what I should get? If I go to Germany, will the language on the back of the packages (describing the product) and the menu board be in German? I'm curious because I see English used on the front of packages everywhere when I do a chercher for Starbucks images overseas. How do toi view Starbucks expanding into the Chinese market? Doing a research paper on Starbucks. Any Starbucks fans please help par answering a 2 minute survey! (Note: I first published this on LinkedIn. I thought fellow fans might enjoy it). Did toi ever see a movie that toi felt was speaking to toi - one in which the character experienced something that toi could relate to in your gut? ou maybe toi heard the lyrics to a song that captured your personal heartbreak? ou maybe toi saw a commercial for something toi just had to have – as if someone had developed the solution to your very personal problem? Get ready for a new Starbucks order! a comment was made to the poll: What is the best frappucino? a comment was made to the photo: Glittery Starbucks! 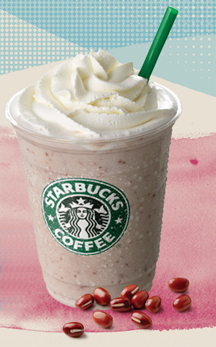 Where can toi buy a Starbucks azuki (red bean) frappuccino? What is your favori Starbucks Drink? Why such pro starbucks? What makes starbuck the best?